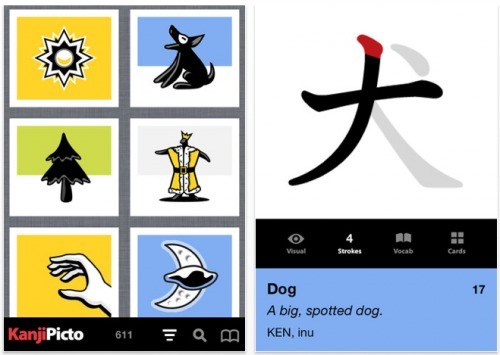 Renkara Media Group has released a new language app that teaches Japanese kanji using engaging visual mnemonics. Instead of using traditional rote memorization, KanjiPictoGraphix offers a different, visual approach where vivid illustrations are used to associate a kanji with its meaning. Each drawing closely resembles and captures the meaning of a kanji. When seeing the kanji on its own, the drawing is recalled automatically, along with its associated meaning. KanjiPictoGraphix contains 611 of the Joyo Kanji, the guide to characters compiled by the Japanese Ministry of Education. Learning these kanji is an excellent step towards mastering written Japanese. For each of these kanji, stroke diagrams are included, as well as the on yomi and kun yomi readings presented in both kana and romanji. Each kanji includes additional related vocabulary. "KanjiPictoGraphix is an innovative and captivating way to learn Japanese kanji. The mnemonic illustrations are simply gorgeous and really draw the student into the language and introduce kanji characters in a dynamic and memorable fashion," said Charles Sieg, President of Renkara Media Group. "We designed KanjiPictoGraphix to be entertaining as well as educational, helping students discover the underlying relationships between characters by exploring themes and similarities without the constraints of traditional methods." "KanjiPictoGraphix is intuitive, comprehensive, and flexible. The app helps students master kanji at their own pace using proven mnemonics to increase retention and recall," said Charles Sieg. "With stroke diagrams, extensive vocabulary, and pronunciations, KanjiPictoGraphix is a powerful resource for anyone learning Japanese, regardless of current proficiency." KanjiPictoGraphix 1.0 is priced at $12.99 (USD) and is available for immediate download exclusively through Apple's iTunes App Store in the Education category.